What is Extreme Sample Converter? Extreme Sample Converter is a multifunctional audio software, browser, player, and program editor with advanced conversion between different sample formats. Automatically searching of loop with different modes and loop search algorithm. VST and DX plug-ins supported (32-bit only). We can process each recorded channel left and right separately with different plug-ins. We can use it for chaining different effects and create new modified recorded sounds. It can be used for signal monitoring when sample recording. Plug-in delay latency compensation supported so for plug-ins with its delay it is automatically calculated to correct position. Together with ASIO support we can play with VSTi instruments in real-time or process audio signals with additional effects when recording. Working with ASIO and MIDI. Possibility of using several midi channels at the same time to record more than one instrument simultaneously. Midi latency adjusting parameter (trimming to correct sample start). Patch normalize option, you don't have to care about input gain's just start record and software automatically gain samples. Sample normalize, each sample will be gained to possible highest volume. ASIO Monitoring, by clicking on mapping you can listen sounds. With MONIT. SPLIT (split monitoring) button switched to on you and moving a splits you can hear sounds related to its velocity. Built-in silence detection algorithms allows you to find a correct start and end of recorded samples. Resuming it is possible to record a samples first, send to an external audio editor for editing and then convert finally to destination format. You can split converter into two functional windows. Thanks to this you can easily work on two monitors. You can send samples to an external audio editor and convert them into another format. Software takes all changes from audio editor (trimming, resampling, filtering whatever you did) and then you can save these new samples into destination format. Now it is possible to set accurate and perfect looping in sample material. Stereo samples can be tuned together so you can set a different loop in the left and right channels and then use XFade. * Factory Sound Banks, monolith HSB files, NKS files and derivative files are not supported. With this option, the program becomes an excellent audio editor, allowing free looping while creating new loops. Editing of the loop is possible separately for the left and right channels whereby very interesting and unique effects can be produced. Not all formats accept this kind of loop editing. e.g. SampleTank and, in general, GigaSampler/Studio don't accept these loops. Loops can be shown even in sizes above 1:1, making it easy to analyze and locate the best point for starting and ending of the loop, and finding the best phase. During displacement of the loop, crackling in the sample playback is not heard, a problem which might otherwise be found disturbing. The program changes the beginning and the end loop points to assure the continuity of playback of the sample. Converting virtual synth to different formats. Support for plug-ins without their own gui. Choosing a patch or bank also possible. This works with all audio cards and it only requires DirectX 8.0 or higher, The low latency let's you play sounds in live (16-bit/44.1kHz quality and 64 voices supported). Also it's possible to hear the result after patch editing in QEdit tool. Sound Blaster card users can use the second way of auditioning by using Sound Blaster Synthesizer. It immediately connects ExSC with the wavetable synthesizer of the card. After choosing patch, it will be loaded to the synthesizer of the card and you can immediately audition ex. EMU, Akai CD before conversion. If any patch is edited, it is possible to hear how it sounds. Also, it's possible, to hear final sounds like Soundfonts. In such cases the conversion to SoundFont format is executed on the fly. Editor allows you to edit many parameters: AHDSR envelopes, Filters, LFO's and other. It is now possible to improve or modify the desired timbre. The editor checks for the proper range of parameters to ensure compatibility with specific formats. Working with the editor is extremely quick and makes it possible to edit parameter (e.g. Filter, Cutoff ) for selected parts of the keyboard, and of chosen dynamic ranges without having to arduously toy with layers and zones as with other editors. This tool allows copies to be made of media like ZIP, MO or CD to one image file on the disk as well as reproducing the data from one media to another depending on their size. Hardware sampler users can make copies of ZIP or MO on CD. The CD's can then be used instead of slower ZIP or MO drives. The virtual disk (the image) is stored in compatible format with Nero or ISO9660 used by the most CD recorders. Supported image formats: *.NRG, *.ISO, *.BIN, *.IMG. Thanks to my complicated algorithms and sound conversion techniques, I can bravely say this program will make it easy to convert samples to another format with the most exact translation. Close attention was given to the most important parameters of the program having effect on the final sound. There are different types of envelope curves, filters and complex modulators. Special attention was given to the method of transfer from/to GigaStudio dimensions. 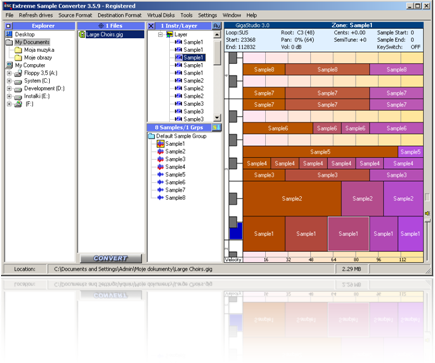 By taking advantage of the program's intuitive presentation, the most important information about the sample structure ( ie. layers, zones, etc.) can be obtained. Also, the sample and it's components are presented in a clear manner. If you look through programs on an Akai CD, you can see how these parameters looked originally. The program reads only those parts of data which are required to be seen. It's a very fast method for browsing very large banks of GM or Akai data. This version supports not only basic audio formats as WAV or AIFF, but also compressed files in the Ogg Vorbis high-end technology. Decompression of the files is incredibly fast. Audio file is kept in RAM memory. The playback of the file, as well as visualization, is done without disturbance from the disk system. The program uses a modern floating-point format ( IEEE 32-bit and 64-bit), making it possible to playback even on standard 16-bit multimedia sound cards. In the case of audio files, ExSC also will display and playback loops. Such options are surely not found on non-media players, so I assume that ExSC can possibly be used as a professional file player. You can choose between different standards (MME or DirectSound). Of course with DirectSound you can use low latency and between selection of the samples there are no clicks. Retrieving files in the chosen format was not forgotten. It's possible to search for files in any directory, disk or CD. With this tool, nested directories on the disk can be scanned. Batch conversions are possible, finding all files on your disk, mark them all, or select and convert them into another format. Electronic Software Distribution (ESD) - you buy a license key, delivery is by e-mail. This secure online registration service accepts all major credit cards: MasterCard, EuroCard, VISA, Delta, JCB, Switch, Solo, Discover, American Express, Diner's Club, UK cheque, US check, Eurocheque, Postcheque, International Money Order, Bank wire and PayPal. If paying by credit card, you can submit your card number by secure http-server, by fax, or by phone. Delivery is by e-mail. Registration Code is sent immediately after placing an order. Make sure that e-mail you will give in order is correct.